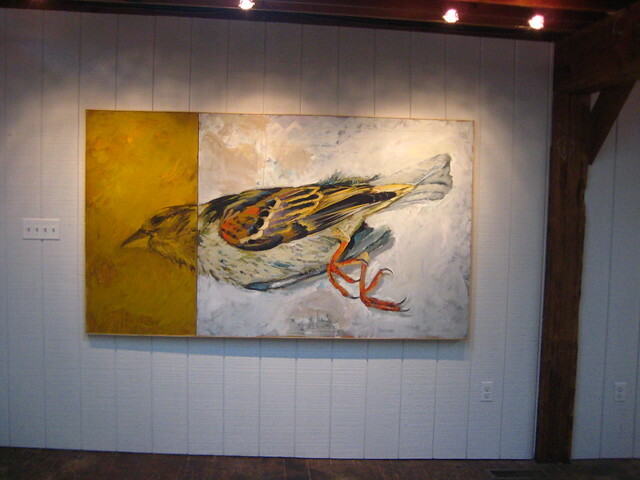 Photo of an older painting by the fabulous painter Matt Kleberg. Source: Moi. I found myself easily distracted from the novel, as much as I’m enjoying it, and watched and listened to the birds instead. We have a gigantic white spruce tree in the yard, and it seems to function as a high-rise complex for birds. Today, it sounded like an avian domestic dispute happened midway up the trunk, and two robins emerged separately, chasing each other with what I can only presume was marital fury. When I tried to focus merely on sound, I could hear at least six different bird calls happening simultaneously. I wanted to know what kinds of birds they were and what they were trying to communicate. I am halfway through Jonathan Franzen’s controversial piece about conservation/birds/the Audubon Society, and so I have been thinking about birds a bit more than usual. Also, our good friends Maddy and Sam are devoted birders, so I always think about them when I notice birds. Simply: I wish that I knew more than I do, which is one of my most frequent desires. Corollary thought: Have you inherited your family’s prejudice against certain animals/forms of nature? Odd question, I know. My parents separately taught me quite a bit about plants (my mother) and animals (my father), and I realized today that I bear a lot of their likes and dislikes, for purely emotional or aesthetic reasons, regarding certain species. For example, my mother loathes Bradford pear trees, and I realized this week that I do too (the stench, the shape, the mendacity). We both love cherry trees and dogwoods, however. My father dislikes blue jays, cats, and hyenas, but loves falcons, dogs, and bears, and so I do too, accepting these preferences blindly, as I have since I was a child. My mother took up birding in her retirement and I think half the birds in the county depended on her for food in the winter. It comforted me to think that she had an influence on whole flocks, that they noticed her absence too. She also raised a fledgling magpie who was dislodged from its nest in a storm. She called it Champ and successfully released him or her back to the wild. I credit her with my love for all animals – I can’t think of any she didn’t like, but of course dogs and horses were the most revered. You write beautifully – I so enjoy these contemplative posts! Sadie tries to chase, attack, and then finally eat carpenter bees. It’s so hilarious — she even tries to play with them once they’re dead. Jeff, on the other hand, likes to lie in wait and hit them with a tennis racket. Basically, the Jagodas are doing their part in diminishing the Raleigh carpenter bee population.